Map of Australia or see the Tasmania Map. New South Wales - Called the Premier State. 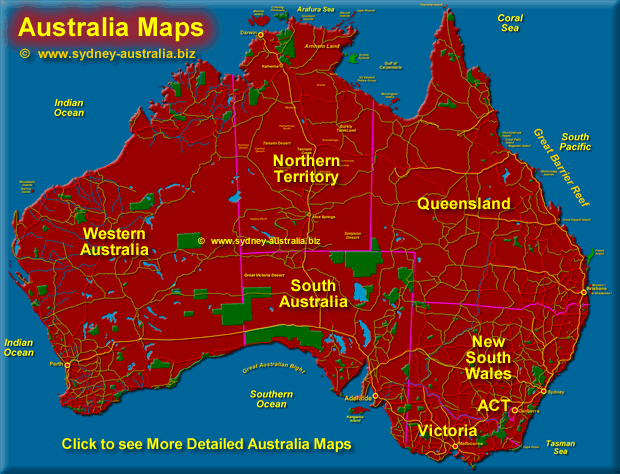 Maps of NSW regions, cities, towns and places to visit. Popular Tourist Places of Interest, dining, shopping, restaurants and Australian City CBD location map. Capital of Australia, Canberra ACT. Putting the NT in AdveNTure. NOTE: What does CBD stand for? Central Business District - the inner city or centre area surrounding the General Post Office. Historically, city places in Australia marked their distances from the location of the General Post Office, or GPO. Many still do. Nowadays, city hotels tend to mark their distances from the airport.